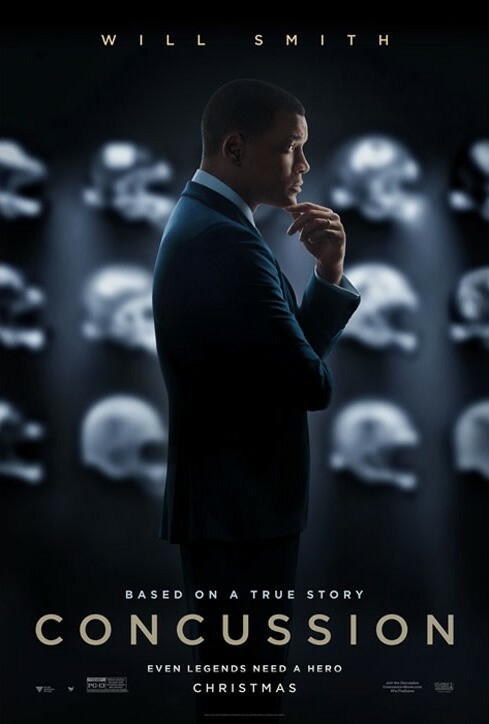 Concussion is a really solid movie that wants to be as important as the topic it’s discussing. The problem with approaching a film in this manner though, is that it immediately sets a precedent for the film to be as weighty and influential in its cultural impact as the topic it's discussing and Concussion simply isn't that. It will start conversations, sure, and if it does its job well enough it may even convert a few football fans to the belief there are serious long-run repercussions to playing the game, but as a piece of art or simply infotainment, is it as effective as it sets out to be? Sometimes. Through writer/director Peter Landesman (Parkland) the film has some really inspiring moments as it attempts to not simply irritate those who are huge fans of the sport, but attempts to logically explain why we need to step back and take a serious look at if the type of lifestyle these men experience down the road is worth a few hours of entertainment on Sunday. 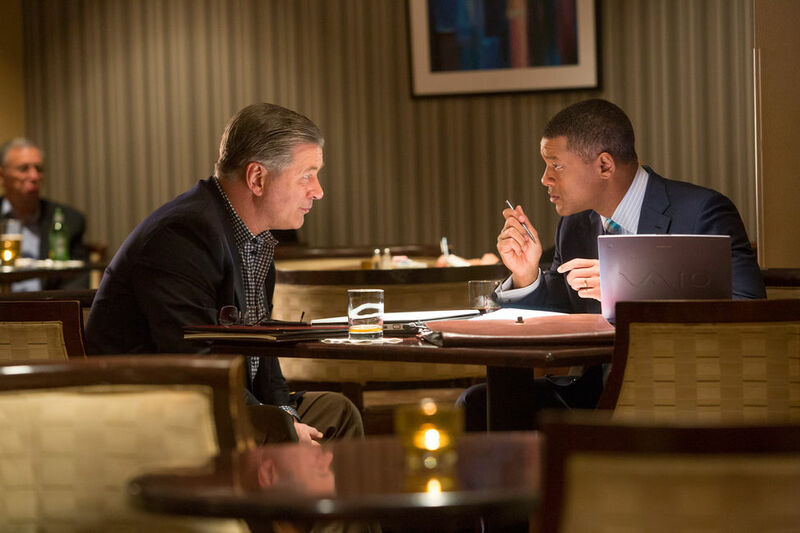 Other times, in between the scenes of Dr. Bennet Omalu (Will Smith) drawing some kind of scientific conclusion or making his case with an NFL board member, the film tends to have lull's that concern itself with a romantic subplot that doesn't connect or one too many time lapses that aren't clearly illustrated. Where the film does tend to stand out is in the scenes that feature Smith's protagonist pushing back against any force that comes between him and his research. If you've seen the trailer you've heard Omalu's speech about how America is the next best thing to heaven and that he was the wrong man to discover such a disease as his entire life he's dreamed of being an American. That, to have discovered a disease that more or less states human beings were never made to play football, makes him public enemy number one and it is in the face of this adversity that Smith and the film shine most. 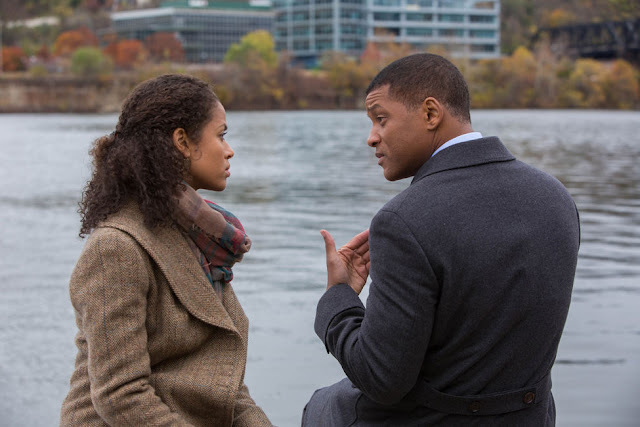 Prema Mutiso (Gugu Mbatha-Raw) inspires her future husband, Bennet Omalu (Will Smith), to continue the good fight. Adapted from the GQ article "Game Brain", written by Jeanne Marie Laskas the film begins in 2002 and first introduces us to former NFL star and Pittsburgh Steeler Mike Webster (David Morse). The opening sequence of the film overlays Webster's speech from the 1997 Pro Football Hall of Fame Enshrinement with footage from his playing days *with an emphasis on the number of hits he took as a center* as well as footage that highlights just how much the sport of football has become ingrained in American culture. Suggesting how impossible it would be for the majority of the league's patrons to turn up their nose to football we begin with the man who most embodied the image of the league in the eighties. Webster is also patient zero in the scheme of Omalu's research that forms the basis for CTE or chronic traumatic encephalopathy. We are introduced to Omalu via his testimony in a murder case that displays not only his level of intelligence through the listing of his many degrees and honors, but through his explanation that he thinks more about the way people die than the way they lived. As a coroner in Pittsburgh under the service of Dr. Cyril Wecht (Albert Brooks) it is only natural that Omalu would be the one to receive Webster's body. While his co-worker, Daniel Sullivan (Mike O'Malley), is a huge football fan and expects Omalu to leave the body alone without performing an autopsy it is immediately striking that a man of Webster's seeming health and age would have gone as mad as he seemingly did. This lunges Omalu into the discovery of the to-be-named CTE which can be summed up as a degenerative brain disease that is caused by repetitive brain trauma. To support this theory Omalu seeks out Dr. Ron Hamilton (Stephen Moyer) and Dr. Steven DeKosky (Eddie Marsan), the director of the Alzheimer's Disease Research Center at the University of Pittsburgh. After publishing his findings with the help of these credible colleagues though, things take an ugly turn as this pits Omalu against one of the most powerful institutions in the world. If we're to get down to what Concussion really is, beyond the ambition of bringing an even bigger audience to the debate of just how dangerous football can be, it is a platform for Smith to give something of an awards-worthy performance as he adopts a Nigerian accent and grays his hair on the sides. Of course, once one comes to actually experience his performance it's easy to see it's much more than this. The thing that concerned me most going into Concussion was that I wouldn't be able to separate the celebrity that is Will Smith from this persona he would be taking on. Dr. Omalu is someone with a unique worldview when discussing America and one that doesn't exactly align with how audiences typically see Smith in any form or fashion. To be able to distance himself from this image for two hours and make audiences believe he is a forensic pathologist would certainly be something of a task. And while one can still see the lingering swag of Smith in some of his body language, especially in the opening scene as we're still accommodating ourselves, I was never distracted. The moment we see Omalu delve into his particular process while performing an autopsy though, we forget we're watching Smith and understand without consciously acknowledging it that he too has delved into his work. The film is essentially a collection of scenes that chronicle Omalu's uphill battle to be heard and taken as credible by a "corporation that owns a day of the week," as Dr. Wecht puts it. Of course, the NFL is doing all they can to discredit anything that would threaten their empire. While this succession of events could easily become repetitive it is the charisma and pure gravitas of Smith's performance, as well as his solid supporting cast, that makes each new battle, each new argument tenser and more immediate. As an audience we understand what's at stake and that the wider the audience Omalu reaches the more drastic of measures the NFL is going to take and so while the pattern is familiar, the natural raising of the stakes give good reason to continue moving towards the edge of your seat. Dr. Omalu meets with Dr. Julian Bailes (Alec Baldwin) to discuss his presentation on CTE to the NFL. Speaking of the solid supporting cast, it is with the help of the likes of Alec Baldwin and Gugu Mbatha-Raw that what are or could have been some of the films weaker spots are made to, at the very least, be acceptable and get the necessary points across. For instance, as Omalu's future wife, Prema Mutiso, Mbatha-Raw is given the unenviable task of making the tacked on romantic angle work and feel natural when she and Smith are literally given zero time to develop anything resembling affection. Instead, the film pushes the two characters from simple acquaintances to roommates and then to lovers in the span of an hour and even less than that given they only share a handful of scenes within this first hour. While it might have been easier to go ahead and make Omalu a happily married man in the beginning rather than adding this task to the movie's to-do list Landesman clearly thought it important that we see the level of dedication Omalu has with his work prior to developing a social life. That this work ethic doesn't change afterward renders this point invalid though, and so it seems unnecessary the movie has to accomplish both its main goal as well as giving Omalu and Mutiso a love story that spans several years and thus events that include a deeper connection than we believe the characters have. This isn't necessarily the fault of the actors as Smith and Mbatha-Raw do what they can with the limited number of scenes they have together, but it certainly feels as if the film should have either given them more to do with one another or cut the romantic angle completely. Of course, Omalu and Mutiso's love story might have fallen victim to the cutting room floor as it's clear the film has been slightly gutted given actors like Paul Reiser and Luke Wilson were brought in to play Dr. Elliot Pellman, a former team doctor and the NFL's one time chairman of their Mild Traumatic Brain Injury Committee, and current league commissioner Roger Goodell while only appearing on screen for a handful of minutes. On the other hand, Baldwin as Dr. Julian Bailes or the Steelers former team doctor and neurologist for the players association, enhances the film by enhancing the fight that Omalu is taking on with real credibility. In what is the culmination of these sometimes stirring and other times only necessary moments that can plod along and do little more than feed us exposition is a movie that is largely fascinating simply by virtue of its topic, but one that could have certainly stood to be more poetic and, in the end, weightier. The movie yearns to be great and you can feel that. It yearns to paint a full picture of how American football can be a mindless, violent game while simultaneously being something on the level of Shakespeare. That while, on the surface, football makes little sense as to why anyone would find such satisfaction in it, that to those who have grown up with it as part of their lives it is a drug they can't give up. Football is a habit they can't kick, an exciting and beautiful metaphor for life on a grand scale. To accept that it might not be all that it seemingly promises to be is a hard pill to swallow and while Concussion gives the beauty of the game it's due its main order of business is to bring to light how something you love can screw you over in the end. It's a heavy handed piece of advocacy for CTE that comes to be undone by small mistakes such as not making clear the lapses in time that give the film a slightly disjointed feel. Little things like several on the nose shots of both actual NFL footage and of pee wee football that can feel like a bit much, but more times than not work in the context of the film and really drive home Omalu's point and make us appreciate his resilience. It must have been as tough for a well-known, well-liked star such as Smith to take on this role as it was for Omalu to have been the one to discover such a disease, but that he did lends the film the heft necessary to fill in the moments of weakness between those that truly make this film work.